Let’s run a simple thought experiment. The peak-oil theory says that over time, production of crude oil should stabilize and then begin to decline. Since we still expect the demand for oil to increase over time, we must conclude that over time, oil will be increasingly scarce, both in absolute terms and relative to other inputs involved in the production of fuels, such as transportation and refining capacity. In other words, over time, we should see crude oil accounting for progressively greater and greater share of the total cost of fuel. Interestingly, this prediction is fairly easy to test. Both crude oil and heating oil are exchange-traded commodities, and, conveniently, both have a standard contract size of 1,000 barrels. Now let’s take the value of a standard heating oil contract, subtract from it the value of a standard crude oil contract, and call the difference “refining premium” (I am sure experts have a better name and/or better procedure for estimating it, but this is just a simple thought experiment, so we should be excused for lack of sophistication). 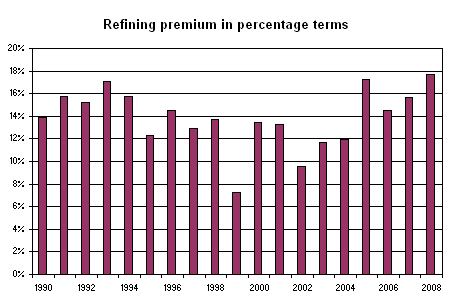 If our reasoning above were correct, this refining premium should decrease over time. Strangely, the refining premium went up in the recent years of record-high oil prices. 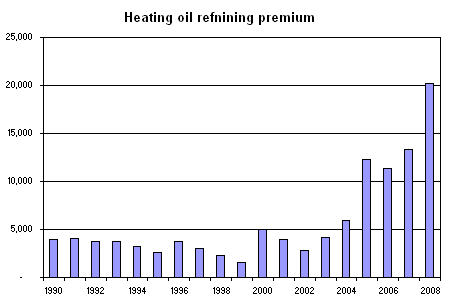 It is, of course, possible that the refining premium simply changes in line with oil prices (after all, it takes energy to crack oil), but the 2007 refining premium is not exceptionally large compared to the 1997 premium, while the average oil price in 2007 ($72) was much higher than in 1997 ($21). So, all in all, it does not appear that crude oil is becoming more scarce than other factors of production required to produce fuels. Can someone fit this observation into the peak-oil framework?